Cool experiment in viral sharing – The global community for audio culture. Billboard today announced a new, very cool strategy for sharing and distributing music. Who do you think is behind it? Major label? Of course not! Innovative, forward thinking indie label? Nope, wrong again. Disruptive tech/music startup. No, that would be too easy. 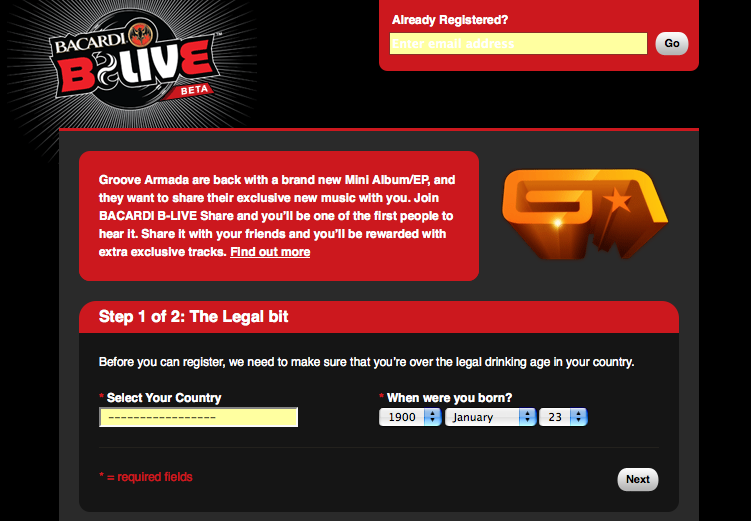 The answer is grobal drinks brand Bacardi, via their Bacardi B-Live partnership with UK dance act Groove Armada. A partnership which turns this drinks brand into a record label. Their model includes a rev share from certain contracted live dates (presumably to be promoted under the B-Live brand). Consequently this new “label” isn’t so concerned with music sales. They want distribution, awareness and mass consumption of Groove Armada’s new content. The answer: give it away for free. The mechanism: as a consumer, to get more free tracks you’ve got to share with your friends. The more friends who download from your shared link/widget/app, the more free music you get. So Bacardi are encouraging file sharing? Of course they are – they’ll make money from it! Awfully reminiscent of the likes of Zshare, Rapidshare, Divshare, and a whole bunch of illegal file sharing services which the rest of the recording industry wants to shut down. Will these services one day work with the labels to help them distribute their music for free, offering features like scaling, analytics, social sharing and more. Good work Bacardi and Groove Armada.